Company OM: Do you Work for Money? Who works because they have to in order to pay the bills? Well... almost everyone! Of course we work for money. Why else would we work? Here's the thing, though. 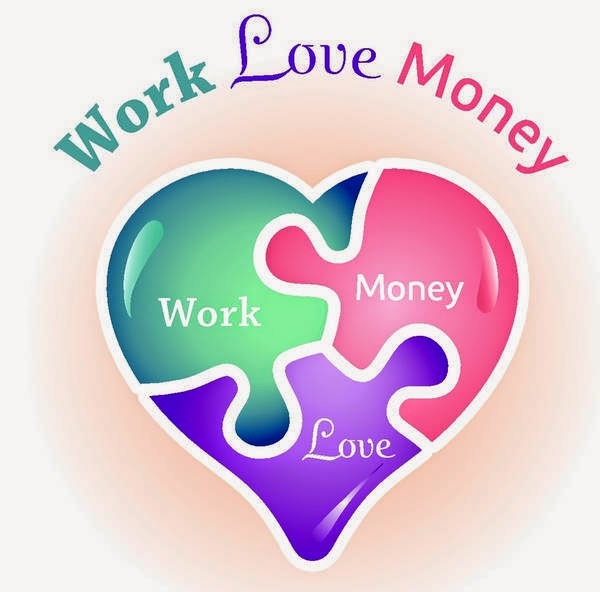 Wanting to make money, more money, lots of money.... is not right or wrong. It is simply a desire or goal you have. Being mindful about that means not attaching to it as being something that is necessary to make you feel happy or successful or complete. What if we took money out of the equation when we decide where to work or what job to take or what business to start or why we stay in a job? It's a no-brainer that money is necessary to live and MORE money is a nice thing to have. Some people place a higher importance on it than others - and that's completely cool. But are you happy? Are you fulfilled? Do you use money as your indicator for how successful you are? After the excitement of the money wears off (because it always does), are you working at something you feel passionate about? Do you feel like you are contributing to something? Are you healthy and well? Do you spend time doing things and being with the people you love? You don't have to cure a terminal illness or create the solution to poverty to feel you are contributing. One of our basic human needs is to feel we are contributing to something. You can serve an ice cream cone on a boardwalk and smile to the customers, and you could be contributing to someone's well-being. Being mindful doesn't mean living on the streets. A mindful leader also has to work to pay the bills. Being mindful means being aware, being in the moment, making conscious choices, and not attaching to the outcomes. So a mindful leader may want to make money, and may even place it high on his or her list of goals - or not... but it's not what makes them happy or unhappy. A mindful leader does not stress less just because they make more money. Stresses are always there whether a collector is calling your house or your yacht just sunk. What does your dream workplace/job/business look like? Almost everyone will have 'make enough money to live the life I want' in the description. But what else? How are you contributing in your job or business? What is REALLY important to you and how can that be incorporated into your workday and/or business? So go ahead and work for money! AND create meaning in your work. If there's no meaning and you feel stressed or unwell a lot of the time, what is your money really worth?